We’ve put together some great menu selections our guests have enjoyed over the years as a starting point for your party planning. If you don’t find what you’re looking for on our menus, please let us know. Accommodating your needs and requests is our top priority. Whether you’re organizing a breakfast meeting, holiday luncheon, or wedding reception, let The Patrician give you a taste of elegance. We pride ourselves on the extensiveness of our menu options. From savory hors d’oeuvres to premium entrees, The Patrician offer delectable dishes for any occasion. All food is prepared on-premises with the highest quality ingredients. We cook with fresh, local and seasonal ingredients whenever possible. Our emphasis is on beautifully presented, delicious food. We care about our guests and are sensitive to the individual needs of everyone who dines with us. Vegetarian, gluten-free and dairy-free, organic, vegan and pork-free meal options are available. The menus on our website are just a start. 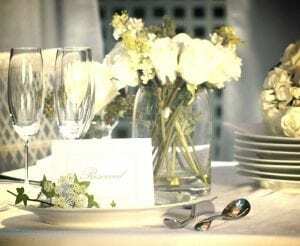 We will gladly work with you to customize a unique menu for your next special event. Let The Patrician cater to you. At a plated meal, guests remain seated at their tables while waiters bring out the entree. This style is the most traditional and typically the most formal. Similar to sit-down meals, guests are seated at tables while waiters place entrees on large serving platters in the middle of the table. This style is considered less formal, but it provides guests an opportunities to interact while passing around the food the table. At a buffet, food is placed on long tables with guests forming lines on either side once they are dismissed from their seats. A buffet can be formal when served by stylish wait staff or more casual with self-serve stations.